"I've tinkered and tinkered, and this is the very best blueberry cobbler recipe I've found. Cakey/biscuit topping with a slight crunch on top and ooey gooey delicious blueberries hidden on the bottom. It can also work with other fruit fillings. 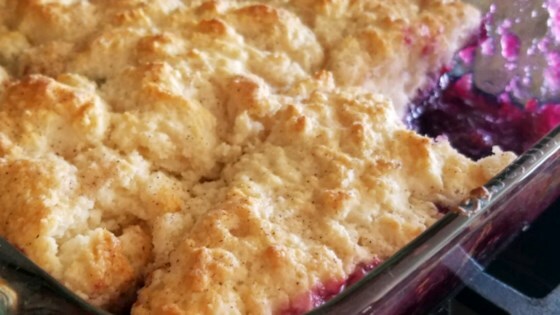 Works best with delicious fresh blueberries and is the perfect summer treat.... An amalgamation of mine and my grandmother's cobbler recipe.... I think it is the best! Serve plain or with whipped cream. Enjoy!" Excellent! I was looking for a recipe that tasted like my grandmother's and this one did.